One of my very favorite signs of spring (when I used to live in a place that had such things) were the dogwoods blooming out every season. Ah. Breathtaking, and as intoxicating as that first warm day when you are so super tempted to go barefoot through the damp, soft grass. So this cake caught my eye in about a second. The vibrant grass green color is the perfect choice to celebrate new growth and birth. The choice of the dogwood echoes that feel as well. Stand out details include the freeform piped trim, and the monochromatic satin ribbon at the base. But my two favorite details? First, that “cakestand” – which appears almost to be a ceramic oval tray, flipped over and repurposed. It’s a clean, almost minimalist look and it stands out from the many, many foiled-covered cakeboards we see (as well as the antique silver stands. Love them…but we see them a lot.) Secondly, the cake layers are actually oval. You can’t tell from the picture, but it’s true! And nothing sets a cake apart these days faster than an interesting shape. 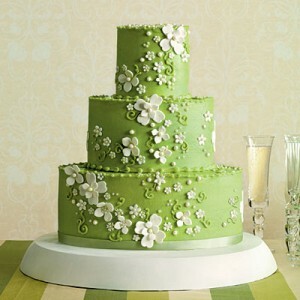 This cake is the lovely work of Jan Moon of Dreamcakes Bakery, located in Homewood, Alabama.